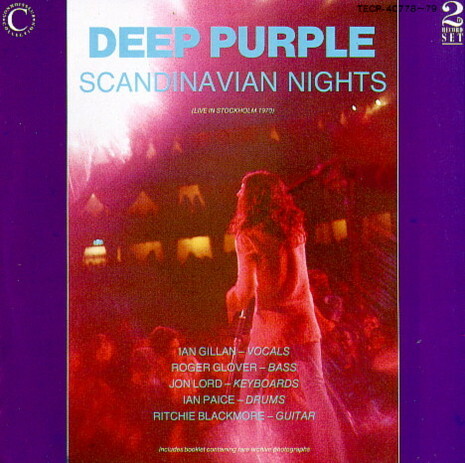 Scandinavian Nights is a double live album by Deep Purple. It was originally recorded by Swedish National Radio for a radio show called Tonkraft at the Stockholm Konserthuset on 12 November 1970, but not released until 1988. Tapes re-mixed by Tom Leader at Angel Studios. It remains the prime example of the early Mk II set list and ferocious concert dynamics. The US double CD, released in 1992, was titled Live and Rare, while the European double vinyl and double CD, released in 1988, were both titled Scandinavian Nights. The European vinyl release contained a limited edition picture booklet. The original mastertapes were later discovered and were remixed for a re-release as Live in Stockholm in 2005. The track timings printed (on both European vinyl and CD) refer to the length of the actual songs, in-between pauses are not included, but the timings on the US CDs do include the pauses.